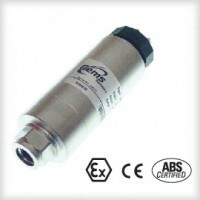 The 4700 series pressure transducer provides precise laboratory type measurements in a rugged industrial package complete with turndown capabilities. Exceptional levels of stability and other performance specifications are achieved by using a sputtered sensing element, which achieves a molecular fusion of a strain gauge material, an insulating material, and the 17-4 PH ss sensing element. Sputtered or thin film technology provides years of worry free measurements under demanding real world conditions. ATEX intrinsically safe versions available.